The Maned Wolf (Chrysocyon brachyurus) is the largest canid of South America and the only species in the genus Chrysocyon. 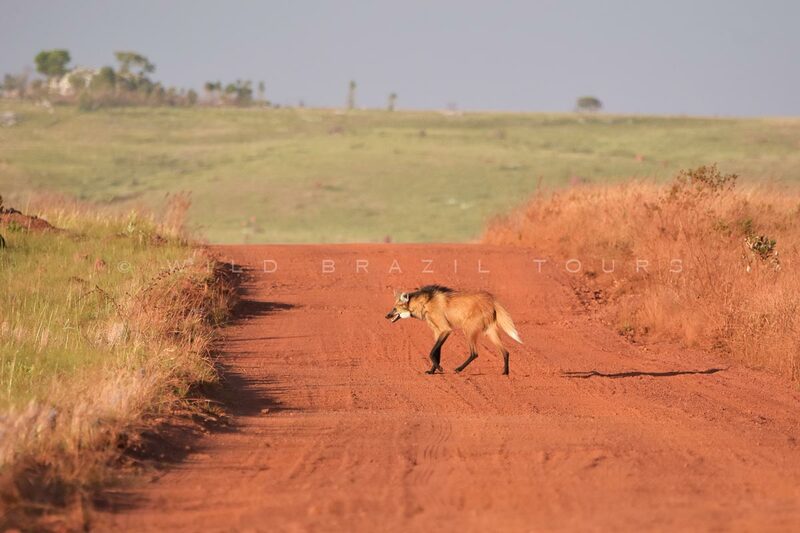 In Portuguese it's named Lobo Guará, the term "guará" comes from the indigenous Tupi language and means red in reference to its predominantly reddish-brown color. 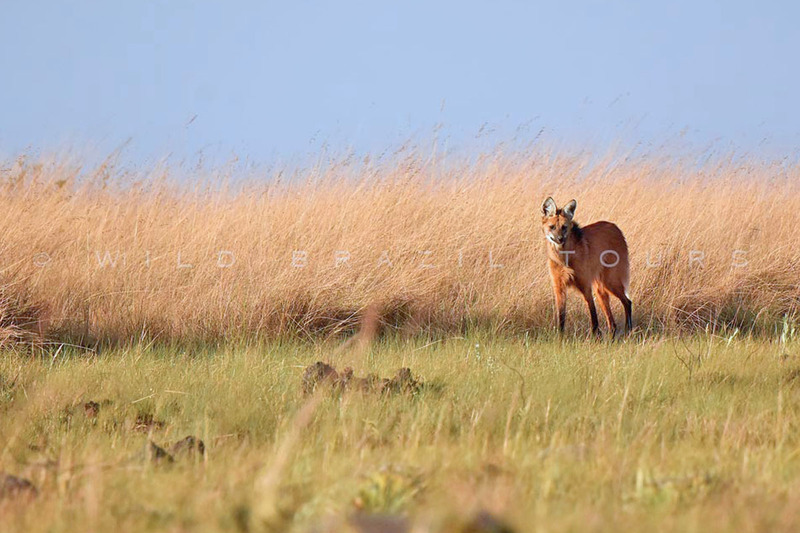 The Maned Wolf is a typical Cerrado species, it's found in grasslands and scrublands of central South America, in particular in the Brazilian Cerrado. 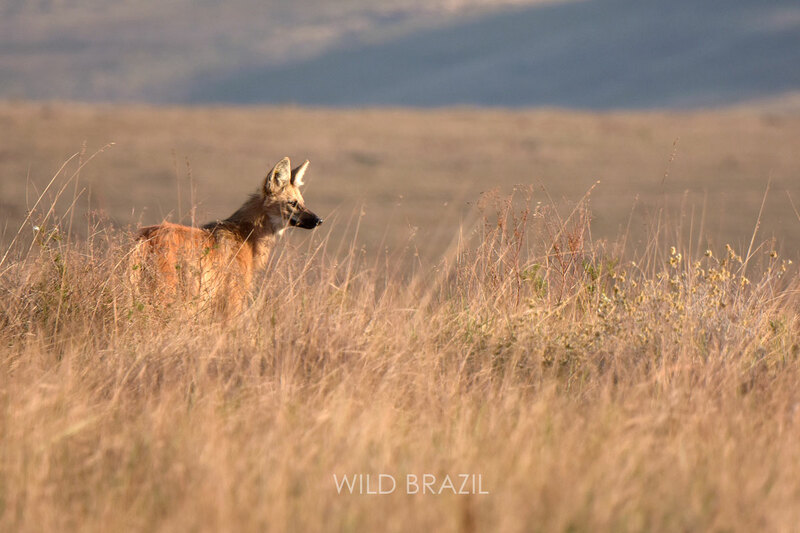 The current population of Maned Wolves is estimated at approximately 17,000 mature individuals with the majority of the population (>90%) in Brazil. In the last decade the population has decreased due to deforestation, habitat lost, road kills, hunting, human persecution and disease. It's considered Near Threatened by the IUCN and Vulnerable by the Brazilian government IBAMA. 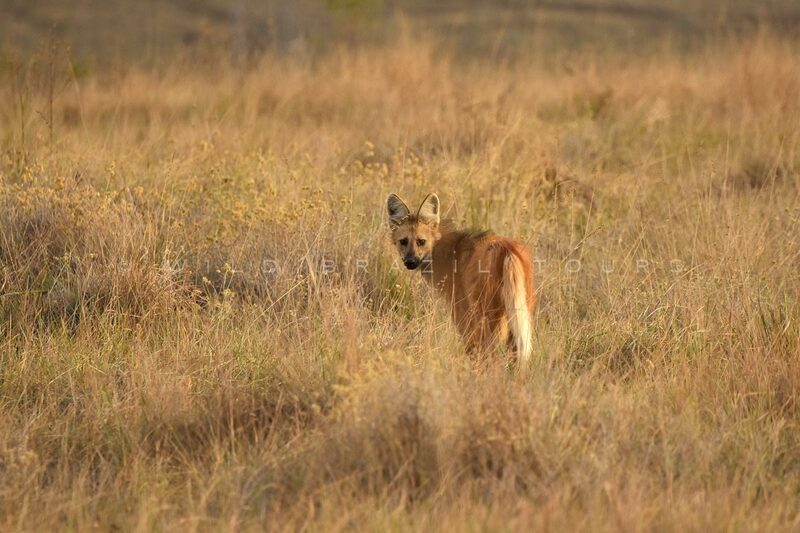 Maned wolf is solitary and very timid, only during the breeding season it's possible to see more than one at a time. Its territory is quite large, up to 123 square kilometers. Communication is mainly through scent marking, but also occur vocalizations. The activity is related to the temperature and humidity, it is not necessarily crepuscular, for example, during the dry season when temperatures drop drastically during the night, the species is more diurnal having higher activity during the day when temperatures are likely to be warmer. In contrast during the wet season activity is typically nocturnal, except after extended periods of rain when the species can be active during the middle of the day. With its long and agile legs, the wolf can easily climb hills and jump at the time of hunting. Their mating season ranges from March to July. Gestation lasts 60 to 65 days and a litter may have from two to six black-furred pups, each weighing approximately 450 g. Pups born between May and September and are fully grown when one year old. The Maned wolf is omnivorous, eating a combination of fruits, vegetables and meat. It often preys small birds, rodents and frogs, and eats fruits such as bananas, apples, avocados, but mainly the "lobeira" (Solanum Lycocarpum). It has an important role in the dispersion of seeds of the Cerrado fruits. 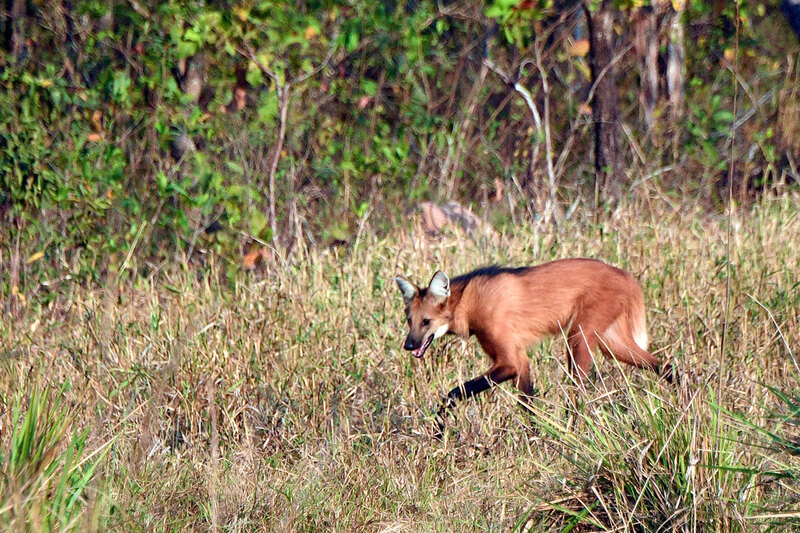 The Maned Wolf walks by moving the legs on the same side of its body. This behaviour is common to few mammals species such as the giraffe and the camel.